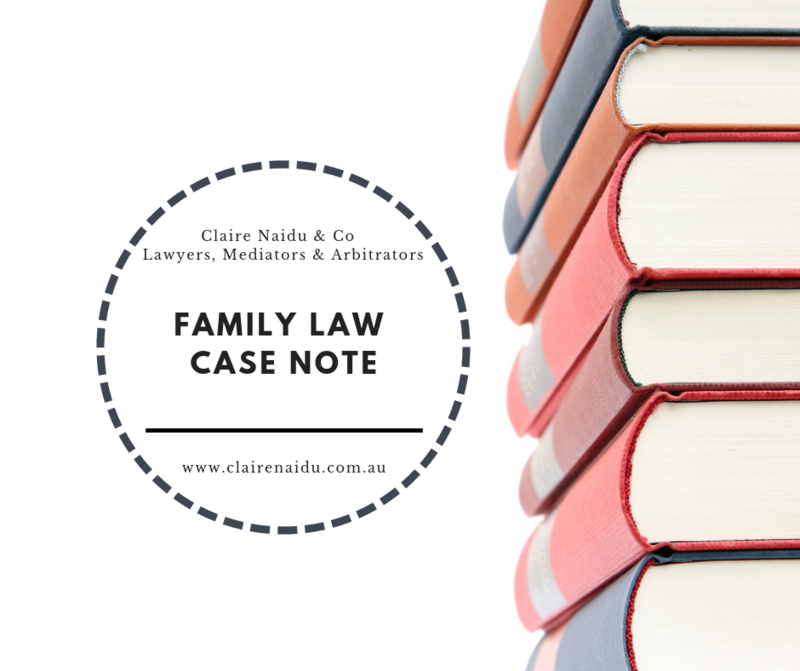 This was an Application in an Appeal, heard by the Appellate jurisdiction of the Family Court of Australia heard in Sydney on 6 September 2018 before Justice Aldridge. The judgment was delivered on 19 September 2018. The Applicant sought that the respondent provide a copy of the transcript of the proceedings before the original Judge. The questions, discussed was whether the court had the power to make such order. The case of Sampson & Hartnett (2013) FLC 93-542 was discussed. The Appeal was made as a result of the primary judge failing to disqualify herself from the hearing of the property and parenting matters. The Appellant sought to have her appeal reinstated following the appeal having been deemed abandoned because she failed to file her appeal books in accordance with the due date prescribed with the procedural orders. Further, the Appellant sought that the other party, the respondent, provide the Court with a copy of the transcript. At the original hearing, the primary judge was told that the parenting proceedings had settled and was informed of the proposed orders. The consent to those orders was then withdrawn. Her Honour then felt obliged to disqualify herself because of what she had heard about the intended consent orders. The financial matter, which was an application to set aside a financial agreement, proceeded. Judgment was reserved but not delivered, pending the outcome of this appeal. The parenting matter has been heard and determined by another judge. …The grant of an extension of time under this rule is not automatic. The object of the rule is to ensure that those Rules which fix times for doing acts do not become instruments of injustice. The discretion to extend time is given for the sole purpose of enabling the court or justice to do justice between the parties: see Hughes v National Trustees Executors & Agency Co of Australasia Ltd  VicRp 27;  VR 257 at 262. This means that the discretion can only be exercised in favour of an applicant upon proof that strict compliance with the rules will work an injustice upon the applicant. In order to determine whether the rules will work an injustice, it is necessary to have regard to the history of the proceedings, the conduct of the parties, the nature of the litigation, and the consequences for the parties of the grant or refusal of the application for extension of time: see Avery v No 2 Public Service Appeal Board  2 NZLR 86 at 92; Jess v Scott (1986) 12 FCR 187 at 194-5; 70 ALR 185. When the application is for an extension of time in which to file an appeal, it is always necessary to consider the prospects of the applicant succeeding in the appeal: see Burns v Grigg  VicRp 113;  VR 871 at 872; Hughes, at 263-4; Mitchelson v Mitchelson (1979) 24 ALR 522 at 524. It is also necessary to bear in mind in such an application that, upon the expiry of the time for appealing, the respondent has “a vested right to retain the judgment” unless the application is granted: Vilenius v Heinegar (1962) 36 ALJR 200 at 201. It follows that, before the applicant can succeed in this application, there must be material upon which I can be satisfied that to refuse the application would constitute an injustice. 10. The solicitor for the applicant deposed that…the appeal books were not accepted for filing because they were not securely bound, they referred to a discontinued appeal and the cover sheet was deficient in a number of respects. He went on to say that it was too late in the day to have the appeal books spiral bound and to attend to the other matters. Ordinarily this recitation of events would lead to the conclusion that the appeal should be reinstated, however, the issue of transcript remained outstanding. Should the respondent be required to provide the transcript? Two propositions were advanced. One, that the applicant could not afford the transcript and the second is that the respondent already has a copy of it. It was accepted, or at least assumed, that at the applicant has some financial difficulties. It was an accepted fact that the respondent had a copy of the transcript. However, the respondent asserted that his contract with the provider of the transcript prohibited him from providing a copy to the applicant as it would be a breach of copyright. In Sampson & Hartnett (2013) FLC 93-542 (“Sampson”) the Court held that it has the power itself to obtain a transcript and can do so in the exercise of its discretion where the interests of justice require it (at ). The basis of the Court’s power to order the provision of a transcript is seen as the exercise of its incidental powers necessary to fulfil the statutory function under s 94(2) of the Family Law Act 1975 (Cth) (“the Act”). Whether that extends to an order of the present kind is doubtful. Counsel did not refer to any authority that showed that the orders sought could be made, and His Honour was concerned that if such order was made, it would, in effect, cause a breach of copyright. If the Court were to request the transcript and provide the parties, it would be at the cost of the Court. In Sampson the Court noted that the provision of transcript by the Court would be exceptional. I consider that the same high threshold applies to orders directed to the respondent who is, after all, opposing the appeal. In Sampson at , the Court set out a number of factors that ordinarily would be taken into account in determining whether the Court would provide the transcript. Not all of those are applicable to the present circumstance, but some undoubtedly are. He also pointed out the relevant proceedings related to financial interests of the parties and not the best interests of children, of which, there is some public interests in the appeals court being adequately equipped to deal with the issues before it which carries greater weight. It is true that in other jurisdictions a judge’s refusal to disqualify him or herself is not of itself an appealable order because it does not of itself determine the rights or interests of the parties (see, for example, Barton v Walker  2 NSWLR 740; Bainton v Rajski (1992) 29 NSWLR 539). Rather, a person who wishes to appeal from a judge’s failure to disqualify him or herself must appeal against the orders ultimately made, relying upon that failure as one of the grounds of appeal. An appeal lies to a Full Court of the Family Court from a decree or decision of a Judge exercising original or appellate jurisdiction under this Act rejecting an application that he or she disqualify himself or herself from further hearing a matter. Costs were considered. It was estimated that the cost of the transcript would be $5,000 for the four days of hearing. However, the relevant events were on two days only and Hi Honour did not see why it would not be sufficient to obtain just those two days which would lessen the cost. Further, it was pointed out that the applicant did not oppose an order being made on 19 June 2018 that she provide the transcript by 31 July 2018. Finally, it is unlikely that not making the order sought will stifle the appeal. Counsel for the applicant said that if the order for the provision of the transcript by the respondent was not made, the applicant had other avenues for the provision of the transcript. She said that her solicitor would obtain it. His Honour considered that the transcript would be essential to the appeal as it is only by reference to it that the applicant will be able to show error. (1) Pursuant to r 22.44 of the Family Law Rules 2004 (Cth), Appeal EA61 of 2018 is reinstated. (2) The time in which the appellant is to file and serve the appeal books is extended up to and including 24 September 2018. (3) The time for filing and serving an electronic copy of the transcript is extended up to and including 10 October 2018.